In an extremely difficult winegrowing year such is 2014, mainly because of high rainfall in the vegetation period and in the time of harvest, only a very good vineyards were able to preserve and provide exceptional quality grapes. 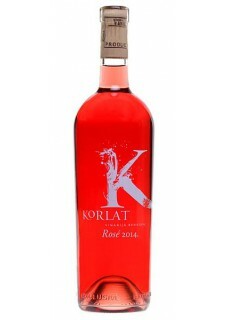 That is the main reason why these extreme years are confirming the huge potential of Korlat, where despite of the poor conditions the quality grapes is never problem to obtain. Base for this rose is the king of red wines, Cabernet Sauvignon, which contribute in aromatic profile with plethora of its various flavors. Taste is full, warm, harmonious wine with a pronounced acidity that gives it freshness. Elegance, luxury, liveliness and complexity contribute to the finely composed varietal characteristics of Syrah. Food pairing: Seafood such as lobster, seared salmon, tuna or duck and delicately cooked rare lamb, shellfish.